Novelis CEO Steve Fisher says the auto industry is going through a "digestion period" after Ford adopted an aluminum body in its top-selling F-150 pickup model. Other automakers have not followed with similar major commitments for leading cars and light trucks. NEW YORK (Reuters) -- Novelis Inc., the world's largest rolled aluminum producer, warned on Monday that plans to shift rolling mill capacity to automotive body sheet are progressing slower than anticipated as automakers prove slow to follow Ford's lead in widespread use of the metal. Novelis CEO Steve Fisher said the industry is going through a "digestion period" after Ford Motor Co. adopted an aluminum body in its top-selling F-150 pickup model. Other automobile manufacturers have not followed with similar major commitments for leading models. 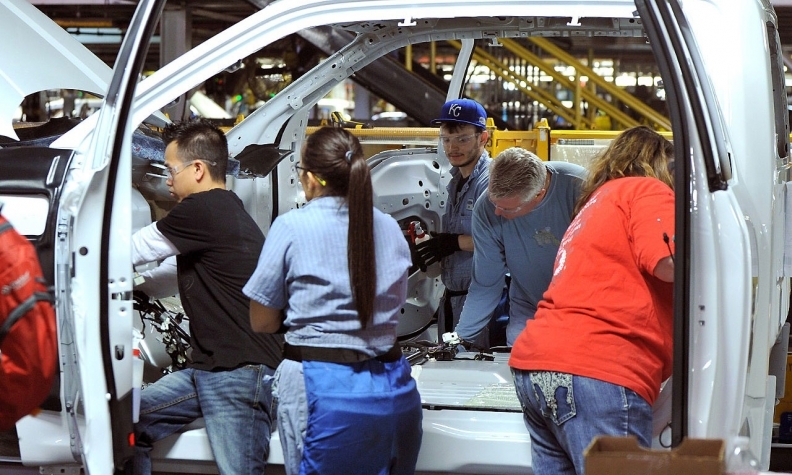 "While Ford has gone very aluminum-intensive and been very successful with the F-150 more recently, everyone's going to look at their portfolios of vehicles and take their own views on how quickly they need to move to aluminum," Fisher said during the company's second-quarter earnings call for its fiscal year 2016. The U.S. aluminum industry, including producers like Alcoa Inc., are bullish on rising demand from the auto industry as carmakers seek to move away from steel, which is heavier, in order to comply with new emissions standards. That comes as aluminum beverage can sheet demand, Novelis' largest end-use market, is shrinking as consumers move away from fizzy drinks due to health concerns. Fisher said that market is contracting around 1 percent annually. Downstream fabricators like Novelis have responded by shifting rolling mill capacity away from beverage sheet production and toward auto body sheet production. Atlanta-based Novelis has said overcapacity in the North American can sheet market would fall as rolled aluminum products makers shift more capacity toward automotive products. The company previously has said it would consider shifting capacity at its Logan, Ky., mill, which supplies more than one-third of the total U.S. can sheet market, toward supplying the auto industry. But Fisher said on Monday that Novelis was not participating in an investment announced last month to expand capacity at the Logan, Ky., mill, which it operates jointly with Tri-Arrows Aluminum. "They certainly are in need of the ability to supply auto sheet. We've obviously built our capacity at other places in the U.S.," Fisher said. Novelis makes products for the North American auto industry at plants in Kingston, Ontario; Oswego, N.Y., and Novi, Mich. The company, owned by Indian conglomerate Aditya Birla Group, reported a net loss of $13 million in its second quarter as aluminum premiums continued to decline.